Gelato is a deliciously light, and much healthier, alternative to ice cream. While ice cream is made using a custard base made of egg yolks, milk and cream, gelato is based on just milk and thickened with either cornstarch or arrowroot. When I was given an ice cream maker a few years ago I went on an insane and unsustainable ice cream making frenzy. I made lovely rich ice creams in many flavours, all with a heavy custard base. And if this wasn’t enough there was additional incidental baking to use up at least some of the egg whites. It doesn’t make for a happy and healthy waistline. So in an attempt at moderation I have switched to gelato. It may not have the same rich creaminess as ice cream but there is a significant calorie saving so it is a happy compromise. I’ll save the ice cream for really special occasions. Which do you prefer, gelato or ice cream? And what is your favourite flavour? Combine the arrowroot with about 1/4 cup of the milk in a small bowl and stir until smooth; set aside. Add the remaining milk, matcha and sugar in a medium sized saucepan and cook over a lowish heat. (My matcha formed lumps in the milk that didn’t look as if they were going to dissolve so I impatiently gave it a quick blitz with an immersion blender; a whisk probably would have sufficed). When it starts to boil, remove from the stove and add the arrowroot/milk mixture; stir. Add the vanilla and stir through. Place the mix in a bowl or jug and chill. When thoroughly chilled churn it in your ice cream maker. I made a simple sugar syrup, flavoured with ginger, to pour over the lychees. It’s very easy to make; simply place the sugar, water and ginger in a saucepan and heat until the sugar has dissolved and the syrup looks lovely and thick and the ginger starts to look translucent; don’t let it boil. If you lack the patience/knife skills to cut the ginger in a way that looks pretty then remove the ginger before serving. 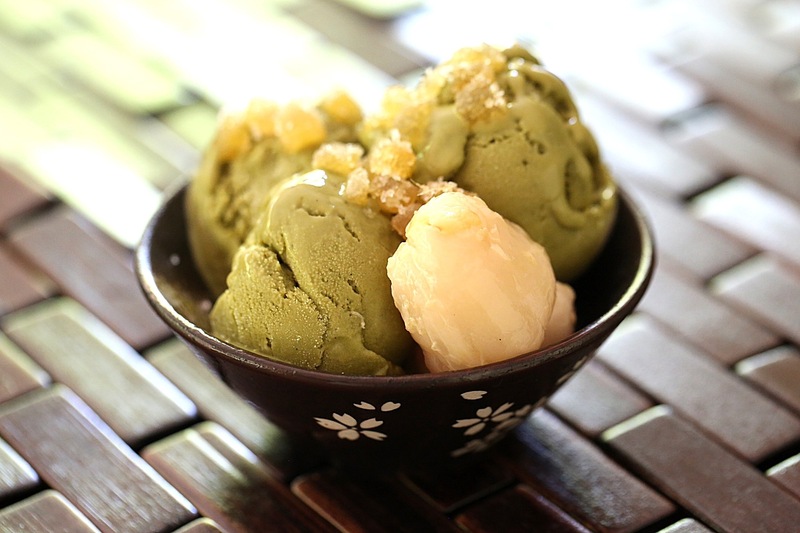 Posted in Gelato, Ice-Cream & SorbetTagged dairy free, diet, egg free, food, food photography, gelato, ginger, gluten free, green tea, ice cream, Japan, lychees, SABH, Sweet Adventures Blog Hop, vegan, Vegan Scoop, vegetarian, Wheeler Del ToroBookmark the permalink. Oh I love lychees and they would go so well with great tea gelato – great recipe! Thanks Christina. I have to admit, this was the first time I have tried lychees. They’re so delicious! Great tip; thank you very much! Thanks Cat. I hope you enjoy it! I’m intrigued to see how the soy would go. We recently switched to soy and I’m loving it 🙂 Thanks for joining the hop! The matcha has such a strong flavour that I didn’t notice the flavour of the soy milk. 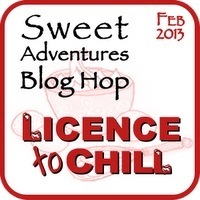 The blog hops are so much fun; thanks! Green tea is a favourite! Great recipe. Thanks Lizzy! Green tea has such a unique flavour; it was fun to make it into a gelato. These flavours sound fabulous and woohoo its dairy free! Must give this one a try for sure!! Thanks Christine. I hope you enjoy it!